Belonging to the Mystecetes (Baleen whale), Brydes whales are found in deeper waters off the UAE coastline. These animals can weigh up to 10 tonnes and measure 12.5 meters in length. 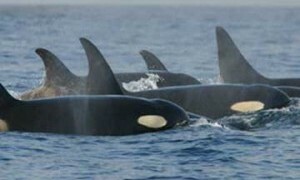 They exhibit a dark grey colour, a large falcate dorsal fin and two characteristic ridges on the forehead. Whales are generally spotted by their tall straight blow visible from a distance. The Arabian Gulf has been identified as a possible migration route for these large mammals. Stranding of this species have occurred in the recent years in Dubai. Known for their acrobatic leaps, spinner dolphins are often found in large pods congregating to feed on squid and other small fish species. 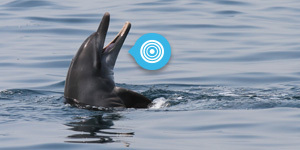 Being a pelagic dolphin these animals are found mainly off shore. Spinner dolphins are identifiable by their narrow heads and slender rostrums, as well as their aerial “spinning” which is where their name derives from. They exhibit a dark dorsum contrasted by a grey side with a characteristic dark stripe running from the flipper to the eye, and a white throat. 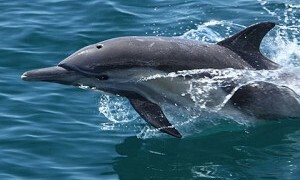 Due to their extremely long beak common dolphins in the Gulf are possibly a subspecies of the long beaked common dolphin (Delphinus capensis), which is generally recognised as different species to the short beaked common dolphin (Delphinus delphis). However, the taxonomy of this genus is still under revision on a world wide scale. 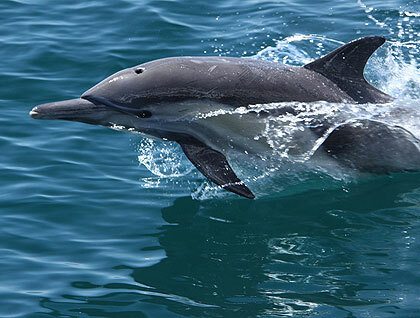 Common dolphins are easily recognised by their characteristic lateral hour-glass shape coloration that spans from the dark dorsal section, to the frontal light yellow to the pale grey towards the rear and white belly. 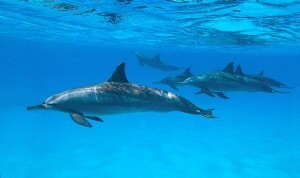 They are generally seen more offshore and in numerous groups. 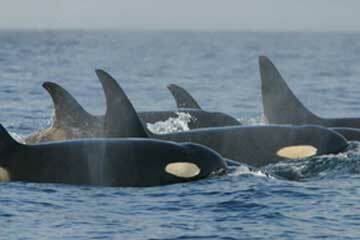 This species is generally unmistakable for its tall black fin and black and white lateral pattern. It is not frequently encountered in the Gulf waters though a number of sightings have been recently reported from the Musandam peninsula up to Qatar and Kuwait. This species occur in the Gulf although rarely sighted preferring oceanic waters. It is easily recognisable from its black slender body, that can reach up to 6 meter of length, small round head with no beak and its distinctive pectoral flippers bulged on the leading edge. 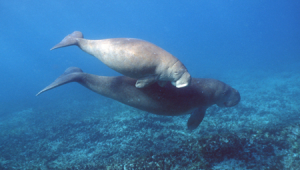 Dugongs – THIS IS NOT A CETACEAN!! The Arabian Gulf is home to the second largest population of dugong after Australia, with approximately 7500 animals being found in our waters mainly in the Abu Dhabi area. Dugongs do not belong to the order Cetacea as they are part of a group of marine mammals known as Sirenian, which includes Dugongs and Manatee. Dugongs are large herbivorous marine mammals. Their main diet is comprised of sea grass. 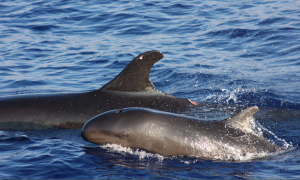 Their coloration varies between dark brownish colour and it can be confused with a small cetacean such as the finless porpoise but the characteristic location of the nostrils at the tip of the snout makes it clearly identifiable. Dugongs where hunted for their fat and hide until recently in the Gulf when they came under international protection.